Although I love, love, loved the white chairs with our “haunted” dining table, they really were too large for our small dining area in the kitchen. They just simply took up too much space. So, I’ve had my eye out looking for some mahogany chairs to go with our beautiful mahogany table. My beautiful table with my heavy white chairs. By now, you’re all familiar with my “haunted” dining table–the one I got on Craigslist for $75. Well last February, I found these beauties at the Greater Muskegon Woman’s Club’s Junk to Jewels Rummage Sale to go with it for another $75. All four for $75! I just couldn’t pass them up. 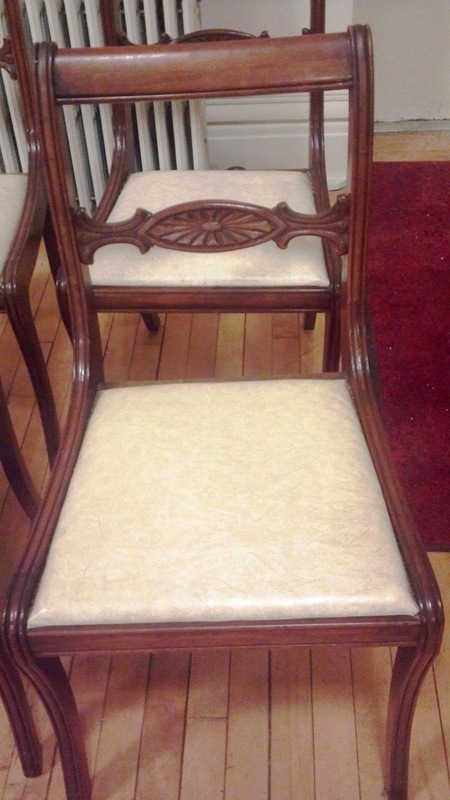 Mahogany chairs I got for $75. The chairs were in excellent shape. What I liked about them is they didn’t have any cross braces like the white ones that made them impossible to push all the way in at the ends of the table. So I brought them home, and it turns out there was nothing wrong with the finish. I thought for sure I’d have to refinish them, but I lucked out. The wood just needed to be cleaned with a little Murphy’s Oil Soap, and then I freshened the finish with a little bit of polish. Look at the detail. Very pretty…dirty, but pretty. The seats, however, were another story. They were vinyl, they were dirty, and they were hard. Jim and I both agreed they needed more cushion. And, Jim, being the wonderful husband that he is, decided that I needed a pneumatic stapler to do them. I wasn’t sure about it at first, but thank goodness he did, because I don’t think my hand would have survived using the the manual stapler!! Now I’m hooked on pneumatic tools! 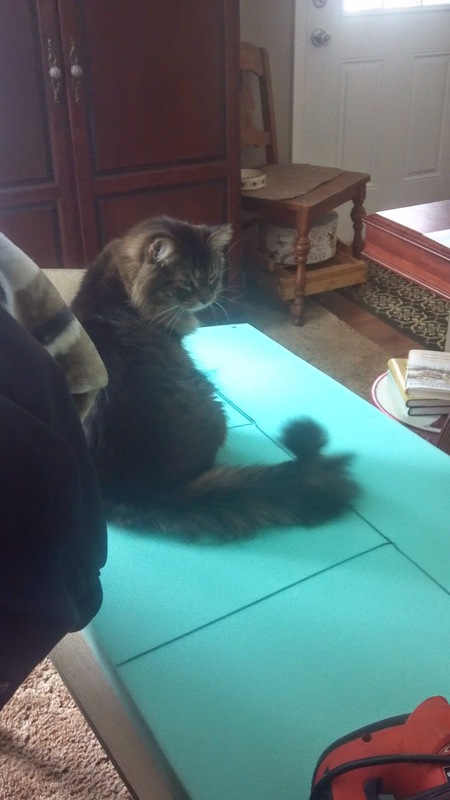 Jasper decided to help cut the foam. At some point someone decided to cover the original upholstery with vinyl. I’m thinking they probably did that in the ’60s. The vinyl just ripped right off, no problem at all. The fabric under it came off just as easily. Here’s the weird part… The original padding was straw or something like straw. I’m glad we got rid of that, because I can just imagine what my allergies would have been like with that in the seats!! All cleaned up with the new upholstery. Turns out that the foam for the cushions was the most expensive part. We decided to go with two inch foam for a little added cushion, and we’re so glad we did. They are so comfortable! 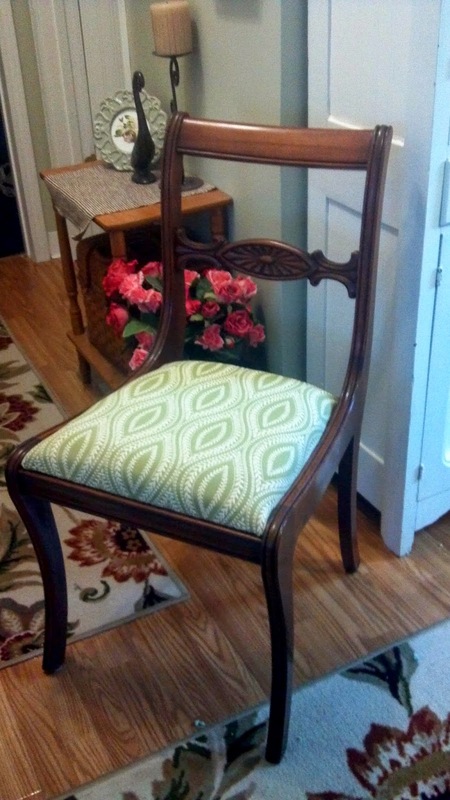 Yes, I used the leftover fabric from when I had my channel back chair upholstered. I just love that fabric, so it worked out well. Plus, since it was leftover, the price was right! 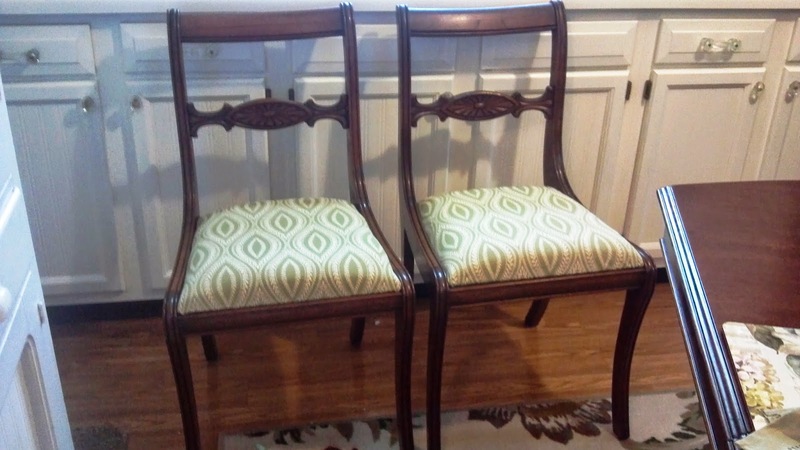 I think the hardest part was getting the fabric lined up the same way on all four chairs. If you look closely, I made sure the pattern was centered to match as close to exact as I could get. Of course, unless you look at all four chairs at the same time, you’d never know, but it’s that little perfectionist in me coming out. After: Looking like new around the table. They really do fit around the table so much better, giving us a little more room to move around. 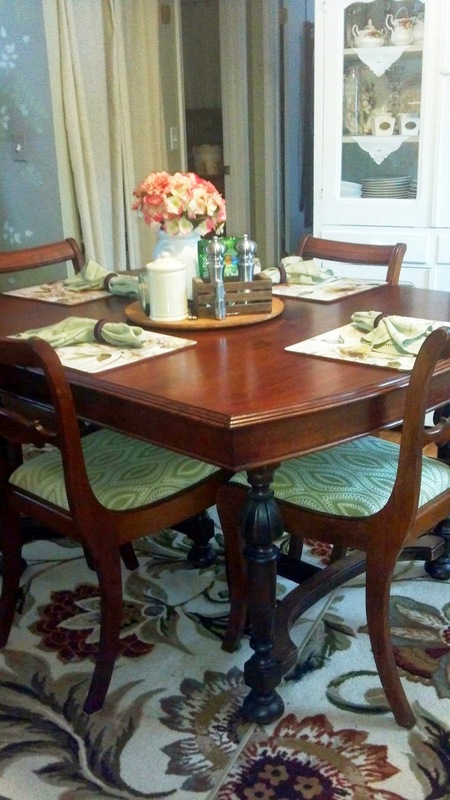 Although, now I can see in this picture that the table legs really do need to be refinished… sigh… We have gotten so many compliments on this “set” now. 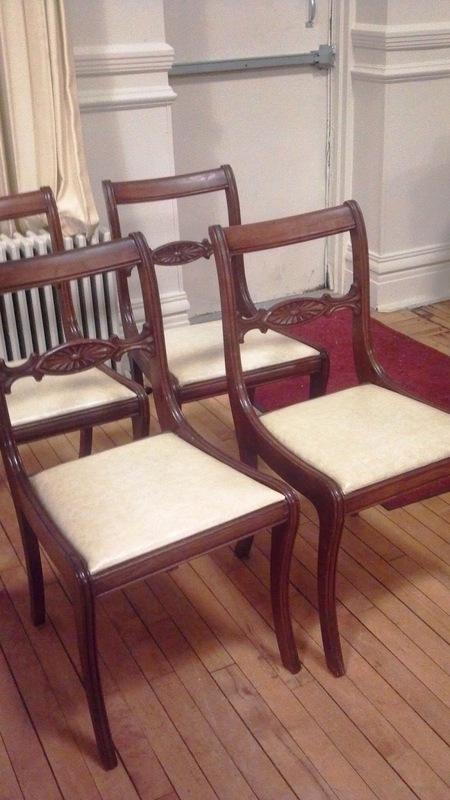 Okay… now for the kicker… This week, I found five more of these chairs!! When all the leaves are in our table, it will seat eight. So I now have enough matching chairs, plus one!! They are not in as good of shape as these four, but I snatched them up for $10 a piece, $50 total!! They need a little work…some of the joints need to be reglued, and of course, the cushions need to be replaced and re-upholstered. But when they are done, we’ll have a complete set. PrevPreviousExciting news for my Art!